Hello. If you have just found FREESCORES, you are in for a treat....free music....free playalongs, and a variety of styles from orchestral to funk to suit your every whim. 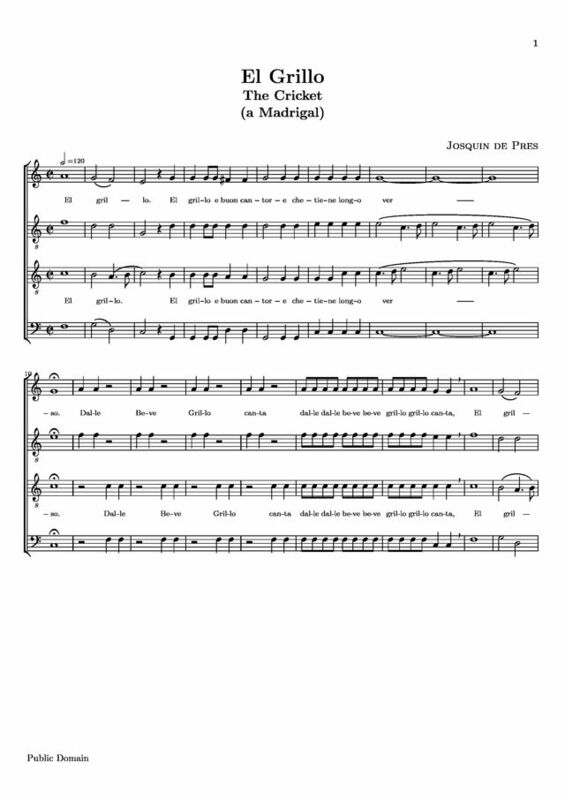 This selection I am playing, EL GRILLO by JOSQUIN DES PRES is one of the many selections that you will find in this site...be sure to browse the many selections...and to hear more of my FREE MP3's visit my website at lenandersonmusic.com. El Grillo is a good example of music during the 1400's. It is the reinvestigation of the Greek theory , namely , music that moved people to various passions. This composer believed that the clear articulation of words was of preeminent importance. When I printed the music of El Grillo, there was NO accompaniment - just the melody. I need the accompaniment to sing this song as a TENOR. This is great, very clear and well-notated. Looks like quite a knowledgeable edit at first glance too! Good day. My name is Bojan Drazic and I`m a choir conductor from Apatin, Serbia. this site is excelnt source of scores for me and my choir. Thanks a Lot. best regards. I'm amazed at the good quality of the file. Relatively easy 4 part piece (ATTB). Sounds good when played quickly! il est très bien pour le débutants. J´ai un petit ensamble de flutes á bec et pour nous c´est un bon commence. merci. I love the tune to this song, and anybody who sings this song and actually knows what it is about, they really do enjoy this peice of work.